Self-confidence is a very personal topic, some people seem to exude it and do, others are great at exuding but not actually having it and then some just find it so hard to have any at all really. 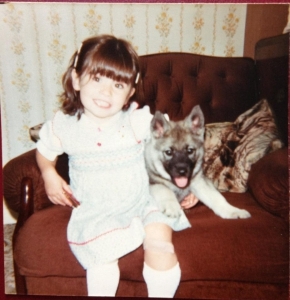 When I was little I was super confident, I have always been sensitive and a worrier but I was confident, this is me (and my dog Bruce). I did party pieces for family all the time. I was on the debate team, I was a lead in the choir, leads in the school plays, I ran in competitions and I did the reading at our communion. I was a smart kid in school, never found anything hard in primary school and then I got to my teenage years and this all changed. I did an aptitude test for secondary school and on our induction day I was asked to go and see the career guidance teacher. She told me that I had scored the highest ever score on the aptitude test in my school (up until I went anyway) and they were expecting a lot of me. This you would think should sort of be a good thing and it was for the first year or so. I never got below an A in tests I didn’t find it really any harder than primary from an academic point of view but socially and personally I did. I had always gotten slagged for being a ‘teachers pet’ or a ‘nerd’ and used to get asked had I ‘swallowed a dictionary’ etc in primary school but it didn’t bother me that much. It was sort of like water off a ducks back as I was much more self-confident then. Around the age of 12/13 this started to be harder to push through. Children have no idea how much they hurt and negatively impact on others lives and as they are children this has to be forgiven, adults who do it are a completely different story. I was once asked by a girl in school why I insisted on doing so well and showing other people up, this was in front of a few of the ‘cooler’ girls in class and they all wanted to know, I genuinely felt peer pressured into not doing as well academically and as my confidence was decreasing rapidly anyway I sort of succumbed. I now know that hormonal changes had a huge amount to do with why I was feeling like this but at the time I didn’t. I had never been overweight if anything I was more on the skinny side as a child as we were always active but I started to get so worried about how I looked and my size. I suffered from eating disorders and depression, I am now aware this is quite common for a lot of teenagers as your body and hormones are changing so much. But at the time I was feeling very, very low. It continued into my 20’s, I always hated what I saw in the mirror, my ‘flaws’ as I saw them were all I could see. To be completely honest this feeling of constantly negatively judging myself has never truly gone, I am FAR less guilty of it now since I had my daughter Maya but I have to keep it in check. I realise that Maya needs a good role model and her mum beating herself up about how she looks and things she does is certainly not that. Weirdly I have gone into professions you may not expect a person with low self-confidence would go into. 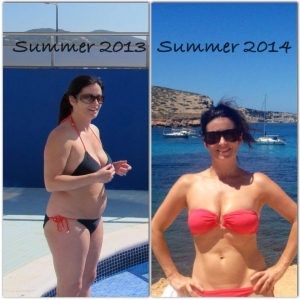 I was a TV presenter, I worked on-air in radio and I am now a fitness instructor and wellness coach. But I fell into the TV work, I really wanted to be a researcher, my Social Science degree was very research oriented and I loved reading into and finding out about things. I also loved media and sport so I very much wanted to get into media research, I had a meeting in RTE with the then Head of Entertainment and another with the Head of Sports and they both suggested as I was telegenic I should look into pursuing presenting as a back door into research. So I did a course in basic television skills, put together a showreel and weirdly got some work. I did actually really enjoy this job but I didn’t love all the schmoozing etc you had to do to get more work. I feel that as a TV presenter you are a sales person and your product is you and if you aren’t super self-confident you won’t be able to sell that product very well at all. Therefore, I left media and went into fitness, it was something I had always loved. I went to LA did my training and opened Pilates Plus Dublin. I started this fitness journey almost 10 years ago and love running PPD and our fabulous clients but I still was not at all self-confident. With the advent of Social Media as such an important marketing tool it has become more and more important to be a brand ambassador for your own brand essentially. Confidence is so important for this, also a lot of the well known fitness people are in their early to mid 20’s and social media and selfies etc have always been their norm, I remember a time when people didn’t even have mobile phones never mind smartphones so it is definitely different for me, don’t get me wrong I love social media and am very active on it but it’s not as organic for me as others. When I had Maya by c-section and I couldn’t exercise, I was also eating way too much and too badly whilst breast feeding and put on loads of weight it impacted even more negatively on my self-confidence. But when Maya was a few months old I realised that I needed her to not be the same as me. Her dad has a healthy dose of confidence and I want her to follow in his footsteps but if she saw me being negative and horrible to myself that would not happen. I started being nicer to myself and I started seeing positive results. When I posted this next image on Facebook, as that was the first place I posted it, I literally was crying and my hands were shaking. I contacted my friends numerous times beforehand getting reassurance about it. I had NEVER put anything like this up before. 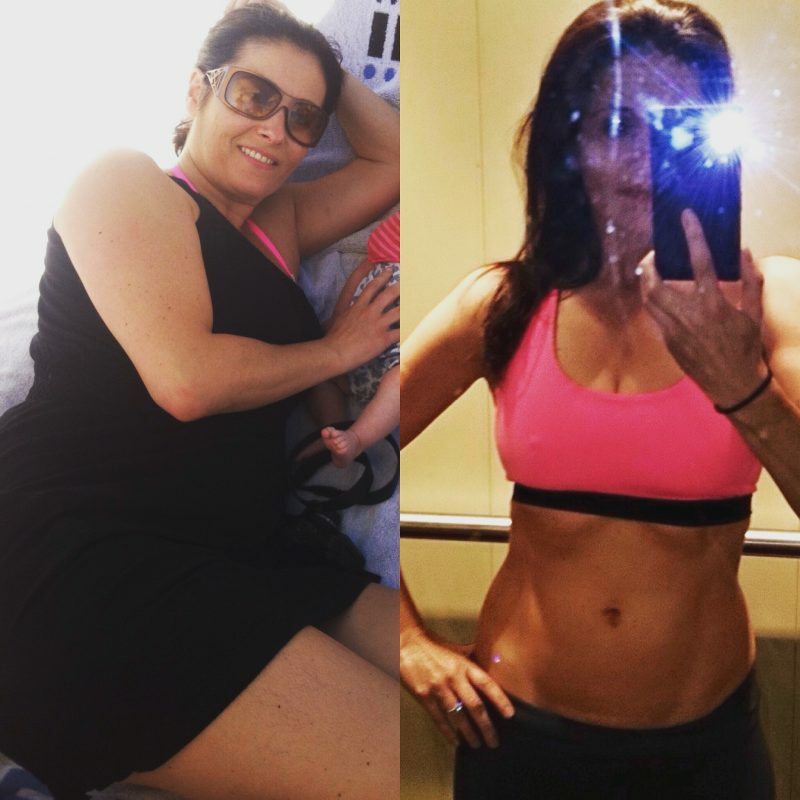 I posted it as I have heard so many times from people that they cannot get rid of their mummy tummy or they are in their 30’s so can’t change their body now, I had a c-section, I was in my late 30’s and had changed and wanted to let others know that a lot of it for me was getting rid of negativity, being happier in myself. I also wanted people to know that it had not been easy and I am a fitness instructor, it took me 11 months to feel back to normal or even better than before tbh. I then decided to try and work as much as possible on my self-confidence and I certainly do not mean just about physical appearance, even walking into a room and approaching people, networking for my business, meeting new people, almost any social and professional set up could be a challenge for me and I know that I sometimes came across as standoffish etc but it was literally being shy and worried about interrupting or annoying people. I want Maya to have a much more confident and happy mum. I am now the mum of an intelligent, happy, fun and gorgeous daughter but she is sensitive, she gets upset about things like I do and I want to try and cultivate and keep her self-confidence as much as possible. I never want her to feel peer pressured into negatively changing her life, I hope she has the confidence to realise that she is amazing. I will always be actively positively reinforcing her.